These crinkling baby toys are the tools you need to keep little minds engaged. Every great handyman or handywoman must have started out as a handybaby, right? 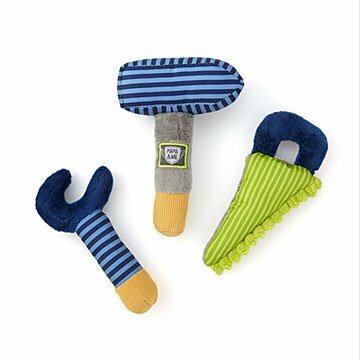 This set of plush tools will certainly have them tinkering around. Each one is a tool for mental and dexterity development, and the gentle crinkling sound they make when squeezed will keep little ones active and engaged. Try clipping them to a stroller or shopping cart as you're tooling around town, or from a crib rail or car seat handle to help them transition to sleep. Made in China. Machine washable on cold cycle.